Hailing from Venezuela, Oscar D’ León has become a living legend in the salsa world. In over 30 years, he’s recorded over 50 albums, received the Award of Excellence from the Recording Latin Academy, and is a Grammy Award nominee (1997) for the album “El Sonero del Mundo”. 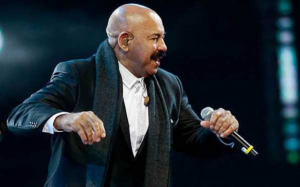 Oscar has also incorporated a little of Latin jazz in his work which has allowed him to record with Latin idols Celia Cruz, Eddie Palmieri and Tito Puente. Here’s your chance to book Oscar D’ León, one of the most well-known and enthusiastic salseros out there!